Early Post as I am going out of the range of cell phone and electricity. Who hoo! 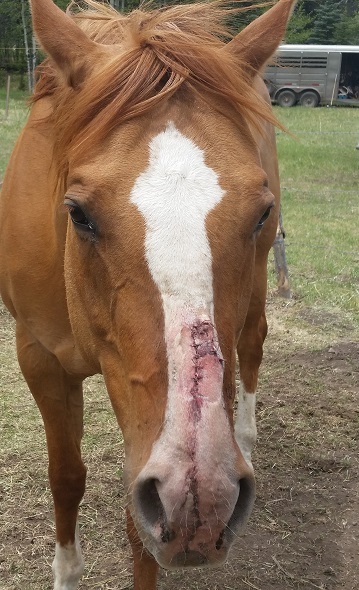 Over Memorial Day weekend, Penny ripped her nose on something overnight while we were on a Back Country Horsemen project. She was in a pen with smooth wire on one side and electric on the other three. She was with Indy and Cometa, who she lives with at home, but I swear Penny causes or gets in trouble when we travel, so from now on, she will be highlined in her own private section (because she has become grumpy with her neighbors and caused highline drama in the past). I guess she caught it on a splice on the smooth wire fence. Anyway, instead of heading out with the crew, we loaded her up and went to Pecos. Fortunately the vet was open and $350 later, she was fixed up. Good thing we had a big halter we could fit above the gash! Three weeks later, she has largely healed. Penny: u would think some people would clean up the area before taking a picture. i am so embarrassed. 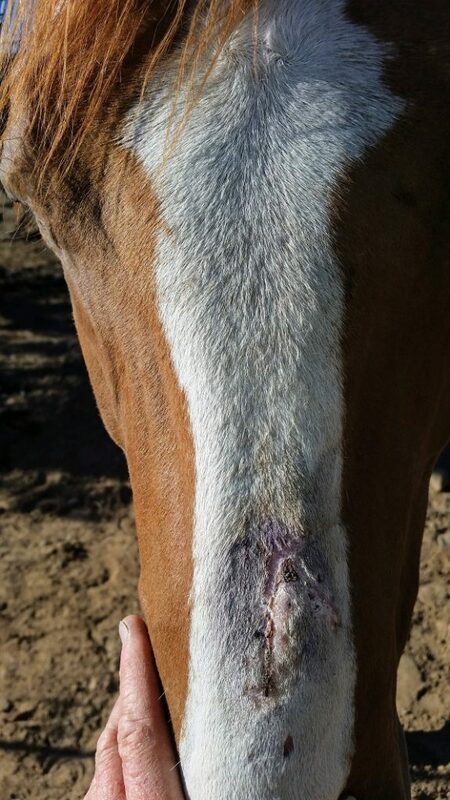 This was a skin wound, so even without stitches, she would have probably healed without much trouble, but it would have taken a lot longer and would have left a larger scar. 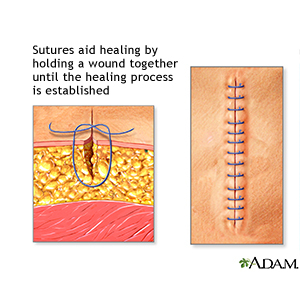 But if the edges are pulled together, far less tissue remodeling has to occur. The wound heals faster and there is less scarring. 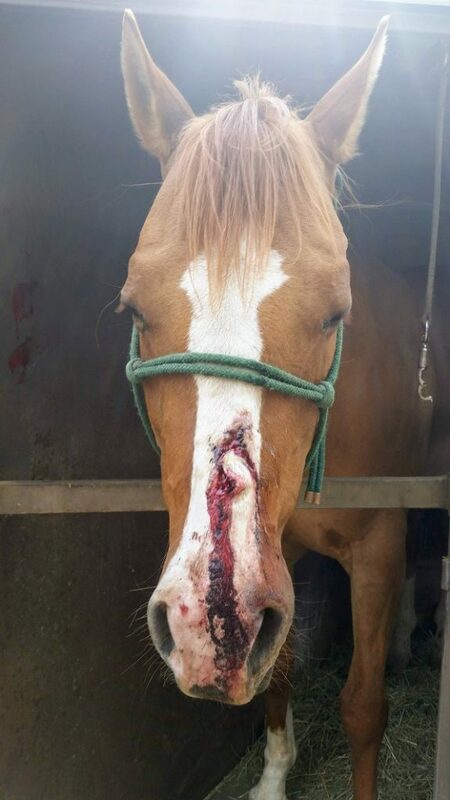 In Penny’s case, if we had let the whole flap die off instead of stitching it on so that most of it stuck and lived, she may have had a big hairless scar because, while it would have remodelled, scar tissue is not the same as the original skin. There is still remodelling going on, but by the time she is fully healed, it won’t be very noticable. While it was in the process of healing, it got a little infected. Maybe because Penny seems to create a lot of dust while eating and all of it stuck to her wound. I used a popular and expensive clear (Dr. Stacie likes clear) wound spray. It seemed to do nothing. I decided to go for the Blue Lotion. This dried the thing up overnight. It has methyl violet in it, according to the label, which is the same thing as crystal violet, which is used in the MacConkey’s medium to inhibit the growth of Gram positive organisms. We use the MacConkey’s plate in Microbiology Lab. I surmised the infection might be Gram positive because Gram positive organisms do like to colonize skin… Anyway, it was effective, and very blue. I am glad she is healing and am fascinated by the way biology works!